You see, by replacing that dilapidated roof with something altogether more durable and eco-friendly, you can create an interior space that adds both value and functionality to your home. Just think about the original expense of your conservatory compared to the tile upgrade and you will soon come around to this way of practical thinking. Thanks to the UK climate, conservatories are extremely underused and who really wants to spend time in a draughty icebox in the middle of winter? The glass structure isn’t built to deal with the near arctic conditions that hit our shores for at least 4 months of the year. 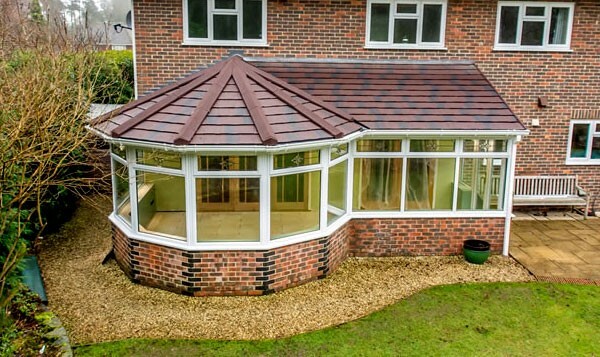 By replacing your existing conservatory roof with lightweight roofing tiles from Britmet, that interior space can be freed up for use every single day of the year. The roof tiles can also work to keep you conservatory nice and cool in the hotter months because the direct sunlight is nicely blocked during the warmest part of the day. We would advise conservatory owners to look into upgrading sometime during either autumn or spring. This will allow you to feel the benefits almost immediately and that small investment will seem like a very shrewd amount indeed. This installation period will also be the best time as far as external weather conditions are concerned. Slate 2000 -This ultra-sturdy tile is both weatherproof and vandal proof and adds some serious security to your home in more ways than one.